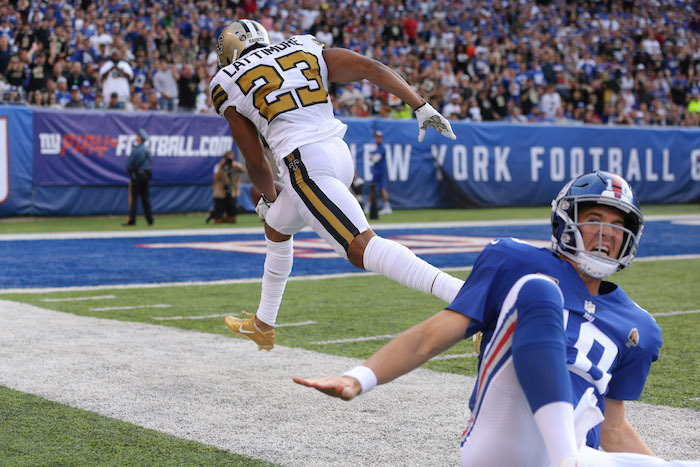 The New York Giants were beaten by the New Orleans Saints 33-18 on Sunday at MetLife Stadium. With the defeat, the Giants fell to 1-3 on the season. For the bulk of the game, the problem for the Giants was once again an offense. The Giants could not score 20 points, nor gain 300 yards, against what had been the NFL’s worst-ranked defense. And the team’s long play of the day against the Saints was only 28 yards. Running back Saquon Barkley was only given 10 carries and team backs only had a total of 12 carries. Wide receiver Odell Beckham, Jr. only caught seven passes for 60 yards. And while quarterback Eli Manning completed 31-of-41 passes, he only passed for 255 yards with his longest completion being 27 yards late in the game. The Giants also fumbled the ball away twice. The game actually started off great for New York. The Saints received the ball to start the game, but went three-and-out and were forced to punt. The Giants responded on their first possession with a 10-play, 75-yard drive that resulted in a 2-yard touchdown pass from Manning to wide receiver Sterling Shepard. The Giants were up 7-0. It looked as if the Giants had stopped New Orleans for a second three-and-out on their second possession. But on 4th-and-2 from their own 33-yard line, the Saints bravely ran a fake punt that picked up 10 yards and a first down. The Saints went on to set up a successful 42-yard field goal and cut New York’s lead to 7-3. The Giants picked one first down on their second series but were forced to punt after an offensive pass interference penalty called on wide receiver Russell Shepard set the team back. The Saints drove the ball 69 yards in nine plays to set up a second field goal, this one from 34 yards out. Things quickly got worse as on the subsequent series running back Wayne Gallman fumbled the ball away after a short completion (some felt it should have been ruled an incompletion). The loose ball was recovered by the Saints and returned 37 yards to the New York 11-yard line. While the Giants’ defense held, the Saints kicked a third field goal to go up 9-7. The Giants’ fourth possession resulted in a three-and-out with less than three minutes before halftime. That allowed the Saints to extend their lead 12-7 with a 7-play, 40-yard drive that set up their fourth field goal. So after the Giants’ initial offensive drive, the next three series resulted a turnover and two quick punts. The third quarter did not go much better for the Giants, who picked up one first down and then punted. The Saints then took charge of the game by responding with a 7-play, 80-yard touchdown drive on their initial possession of the half to go up 19-7 (running back Alvin Kamara scored from 9 yards out). The Giants finally got on the scoreboard again with a 10-play, 75-yard effort. But that long drive did not result in a touchdown, but only a 33-yard field goal by place kicker Aldrick Rosas. Near the end of the 4th quarter, the Giants’ defense did force a three-and-out. But New York’s momentum quickly fizzled as Barkley lost seven yards on the drive’s first play. The Giants punted three plays later. The dagger came with the Saints’ ensuing possession as they drove 74 yards in 14 plays. Kamara scored from three yards out and the Saints were now up 26-10 with less than seven minutes left to play. The Giants scored their final points on the following series, but it was too little too late. Barkley scored from one yard out on a 10-play, 75-yard possession. The 2-point conversion attempt also succeeded, but the Giants still trailed by eight points with just under four minutes to play. Any hope of sending the game into overtime with a second score and 2-point conversion quickly disappeared when Kamara ran for his third touchdown of the game, this one from 49 yards out. In garbage time, New York’s final possession ended with a sack and fumble by Manning. Inactive for the New York Giants were linebacker Olivier Vernon (ankle), cornerback Eli Apple (groin), tight end Evan Engram (knee), wide receiver Cody Latimer (knee), cornerback Antonio Hamilton (groin), quarterback Kyle Lauletta, and center Evan Brown.